A couple weeks ago you may recall when I posted a review about the BodyMedia Armband. I was given an opportunity to take the BodyMedia FIT Weight Management System for a test drive, but I really wasn’t happy with it. I was intrigued by the device and the service because of my history of being grossly overweight and the subsequent loss of 90lbs in 2007. If you took time to read the post you will remember that it was not a positive review from pretty much any way you look at it. I was asked as part of the test drive to blog about the device and my experiences 2-4 times, but after the first couple weeks and the first post I was all done and I asked them where I could send the device since I didn’t plan on completing the test drive. I didn’t receive a response to the email so I decided I would keep wearing it until I did hear back from them. I never did receive a response concerning my email and the question of where to return the device. This being the case I continued to wear it throughout the last two weeks even though I said I wouldn’t. 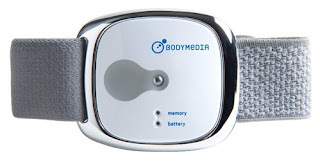 To be fair to BodyMedia, the device became more comfortable the longer I wore it, and the discomfort I experienced in the first couple weeks all but disappeared in those last two weeks. I cannot say that anything else from my first opinion changed though. I still think the device is overpriced and the service is horribly overpriced and should be free given the cost of the device and comparable services. The unit continued to have an excellent battery life and I only plugged it into the computer on Monday’s when I uploaded the data. At that time, the battery was still showing at over 50% charged and I had wore it nearly 24 hours a day for the previous 7 days. I know this device could help some people that have tried everything else, but I still maintain it is not for most people nor is it for me and have already returned it to the box it arrived in. If they do not ask for it back I am thinking about giving it away to someone that is willing to pay the $6.95 – $12.95 monthly cost to use their service since the device is useless without it. Who knows, maybe this unit still can bring someone success. If you are interested in the event I do go this way, please send me an email at info@262quest.com and I will keep you posted. Frankly, if the company would not even respond to your e-mail, AND you are doing a review for them, then customer service is not quite up to par. What if someone had problems with their unit or questions? Jeff, in defense of BodyMedia, this was not them but a PR firm I was dealing with. That being the case I don't think we can draw the same conclusion based on this alone. In defense of the PR firm I have exchanged emails this morning with them concerning this issue and I believe it may have been either a miscommunication or email overload issue. They took the statement seriously and followed up with me first thing this morning. I know a few people who swear by their BodyBugs. Every time I see them, they have them on. I am not sure if the BodyBug is the same thing as the BodyMedia, but I am sure this would work for some people, but my big thing is the monthly cost. I am glad those people get a benefit from the BodyBug. When it comes to running accessories, weight is a very big issue for most runners. Three plus weeks to get adjusted and still not pleased. Hmm, thanks for the heads up.